Reach Out and Read® is a national program that makes literacy promotion a standard part of pediatric primary care so that children grow up with books and a love for reading. Reach Out and Read now has over 6,000 sites across the U.S. For more information on the national ROR program, visit the The Reach Out and Read National Center Home Page. Reach Out and Read® of the University of Michigan began in 1997 with the encouragement and generous support of a few special community advocates. The program was one of the nation’s earliest Reach Out and Read programs, and is frequently consulted by those wishing to start new programs across the state. Reach Out and Read of the University of Michigan has ten clinics affiliated with the University of Michigan as well as two independent clinics. Over one third of kindergartners in the U.S. enter school without the skills they need to learn to read. Research shows that most of these students never catch up to their peers. Reach Out and Read believes the answer is to “immunize” young children against illiteracy when interventions can have the greatest effect: during the first five years. checkups by advising parents about the importance of reading aloud with their children every day and by giving developmentally-appropriate books to children. The program has a special focus on children growing up in poverty. By building on the unique relationship between parents and medical providers, Reach Out and Read helps families and communities encourage early literacy skills so children enter school prepared for success in reading. We believe that Reach Out and Read at the University of Michigan can make an impact by helping parents understand how important literacy is to the development of their children. Our goal is for every low-income child in the area to receive a book from their pediatrician and for every parent to receive encouragement to read to their child every day. 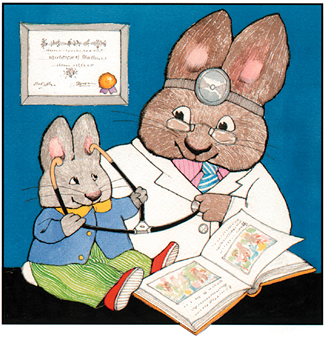 In the exam room, doctors and nurses speak with parents about the importance of reading aloud to their young children every day, and offer age-appropriate tips and encouragement. 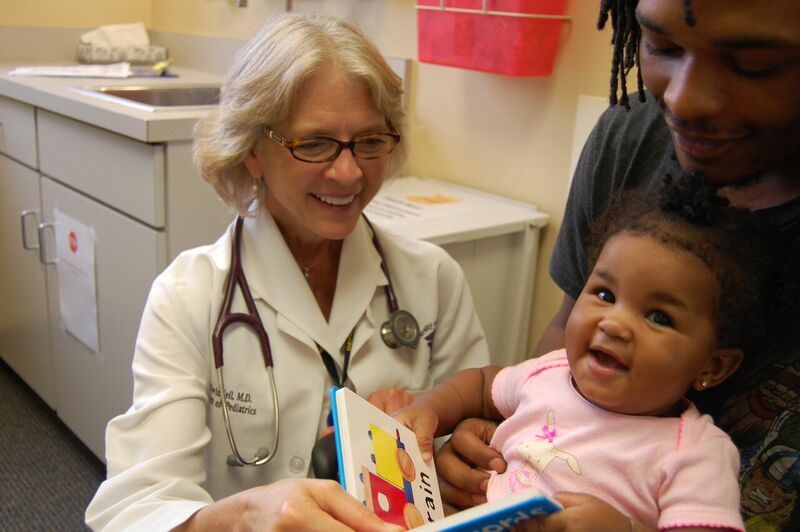 The pediatric primary care provider gives every child 6 months through 5 years old a new, developmentally-appropriate children's book to take home and keep. In the waiting room, displays, information, and books create a literacy-rich environment. Volunteer readers interact with the children, modeling for parents the pleasures - and techniques - of reading aloud. To see the program in action, check out these quick videos showing medical providers talking with families during a 6-month visit and 36-month visit. Research shows that families served by ROR read together more often, and that their children enter school with larger vocabularies and stronger language skills, better prepared to achieve their potential. Reach Out and Read of the University of Michigan has distributed over 250,000 books since 1997. Due to expansion to new clinics and increased participation, we distributed over 28,000 books last year, more than ever before. We are grateful to our donors!